Well they don’t call Canada the Great White North for nothing. Winter has arrived. And when I say winter has arrived, I mean all of it has arrived. Temperatures have plunged to double digit negatives and are forecast to remain so until Thursday. Snow has been falling pretty much steady for twenty-four hours. Transportation via motorized carriage has become, shall we say, eventful. My son has been feverish for two days and threw up in the middle of last night. And not only am I fatigued from the resulting disrupted sleep I awoke to a worsening head cold complete with snot, serial sneezing, itchy nostril, and watery eye. Yup, winter has arrived. I’m actually a fan of winter so long as it isn’t showing up at inappropriate times like May or June or July or August or September or October as is its wont in these parts (see Great White North above). I just love the season. There’s something enchanting when the trees are leafless and fresh snow blankets the world around me. Nature’s deceptive, temporary death seduces me and humbles me. There are also many winter activities and sports that bring great joy to our household. It finally feels seasonally appropriate to be stuck inside cold, bland arenas watching hockey practices. 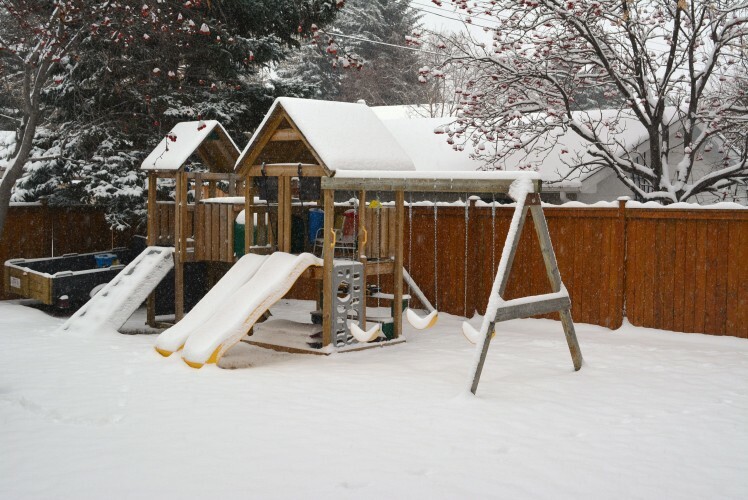 The kids vibrate with excitement at simply eating the freshly fallen snow. Anticipation ignites for skating on the soon-to-be-frozen lake in our community. The large toboggan hill beckons as well. Snowpeople will be created and snowball fights will lead to their demise. Even shoveling snow gives me peculiar pleasure though with snot draining from my head it’s an ugly pleasure. Shoveling is the only exercise routine I have managed to sustain over the years. While it may not be regular, it’s certainly more interesting than lifting chunks of steel at a gym. But mostly I love winter because it means huddling indoors, wearing comfy clothes, sometimes around fireplaces, and enjoying all those warm, rich foods that get forgotten when the temperatures rise in springtime. It’s always sad to see the BBQ shut down for the season but bringing the big soup pot out of storage more than compensates. Despite the head colds and fevers and general malaise around the house, the frosty weather inspired us to whip up one of our favourite soups. 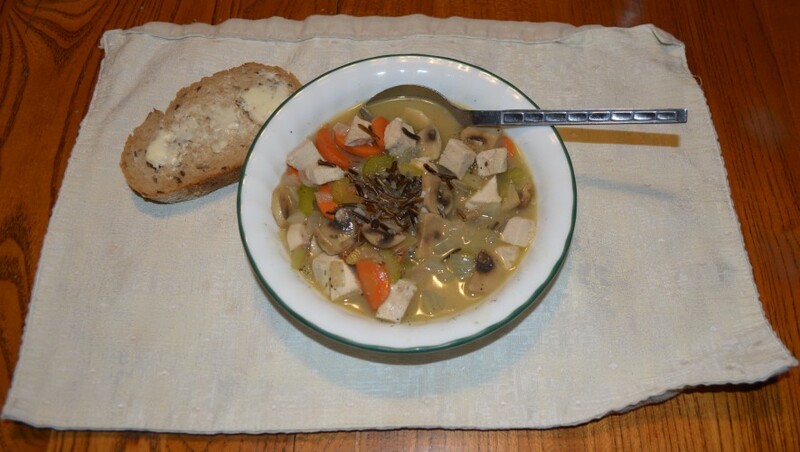 This Chicken and Wild Rice Soup has been a staple of the Schmidt family for generations, decades, years a few months now. The recipe is from the old country, a secret of my mother’s, from a renowned local chef, a generic cookbook I found in the discount bin at Chapters a bunch of years ago. Hey, sometimes the greatest treasures can be found in the most modest of places. What’s important here is that this soup is delicious and a wonderful companion to the wintry weather outside. It’s a simple and fairly quick soup to prepare though if you were inclined to make it more difficult you could do so by fashioning your own broth. Today we coupled this soup with flax seed harvest bread from the bakery at our local grocery store. If I wasn’t dripping snot everywhere I’d have perhaps made some homemade rye bread to go with it, but sometimes easy is better. Regardless, it was a delicious meal and despite our various illnesses a perfect welcome to winter; the very essence of comfort food. And who knows, perhaps one day this Chicken and Wild Rice Soup will be generational staple of the Schmidt family and my great grandkids will only know it as my creation.